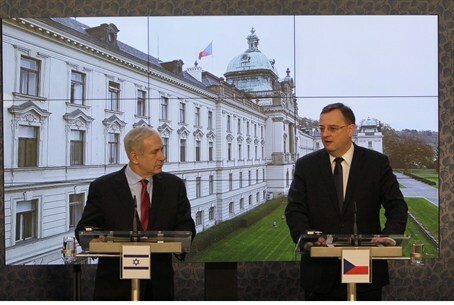 Netanyahu thanks Czech Prime Minister Petr Necas for his country’s vote against the PA's unilateral statehood bid. Prime Minister Binyamin Netanyahu visited Prague on Wednesday where he thanked Czech Prime Minister Petr Necas for his country’s vote against the Palestinian Authority’s unilateral statehood bid at the United Nations last week. The Czech Republic was the only European country among the nine countries that voted against the resolution to recognize “Palestine” as a non-member observer state in the UN. “My real purpose in coming here is to say on behalf of the people of Israel to you and your government and your countrymen and women, to say thank you,” Netanyahu told Necas in a joint press conference. “Thank you for your country's opposition to the one-sided resolution at the United Nations; thank you for your friendship; thank you for your courage. I know that in voting against the one-sided resolution, the Czech Republic stood with the United States and Canada and a handful of other countries against the prevailing international current. But history has shown us time and again that what is right is not what is popular, and if there is a people in the world who can appreciate that, it's the people of your country. Seventy-four years ago, in 1938, in Munich, leading powers of the world forced this proud democracy to sacrifice its vital interests. The international community applauded almost uniformly without exception. They hailed this as something that would bring peace, peace in our time they said. But rather than bring peace, those forced concessions from Czechoslovakia paved the way to the worst war in history. “I know that your country has learned the lessons of history,” said Netanyahu. “So has my country, Israel. That is why Israel will not sacrifice its vital interests for the sake of obtaining the world's applause. Israel is committed to a genuine peace with our Palestinian neighbors – a genuine and durable peace. For peace to endure, it must be a peace that we can defend. No other peace can survive in the Middle East. We remain committed, as you said, to a negotiated settlement between us and our Palestinian neighbors. That solution is a two-state solution for two peoples, a peace in which a demilitarized Palestinian state recognizes the one and only Jewish State of Israel. “Unfortunately, on Thursday,” said Netanyahu, “the Palestinians asked the world to give them a state without providing Israel with peace and security in return. “The UN resolution completely ignored Israel's security needs. It didn't require the Palestinians to recognize the Jewish state. It didn't even call on it to end the conflict with Israel. And this is why it was unacceptable to Israel, and that is why, too, it has been unacceptable to all responsible members of the international community. “Mr. Prime Minister, I'm proud to be here in Prague. I told you just now in our Cabinet meeting that I saw, in my entry at the airport, a bust of Tomáš Masaryk, the great leader of this country, of this nation, and I believe that Tomáš Masaryk would have been very proud of the stand that your country took last week at the United Nations. Thank you for standing up for the truth; thank you for standing up for decency; and thank you for standing up for peace. Thank you."